What did you expect to find inside a cave? 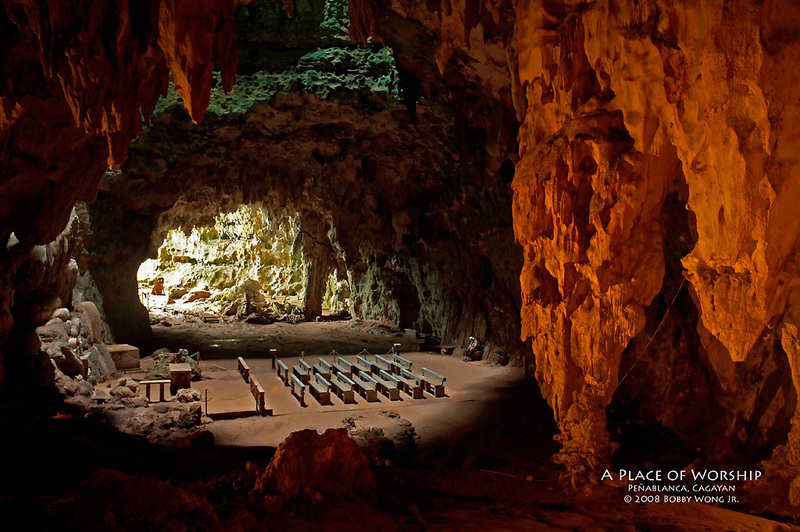 Beside the Pinacanauan river in the town of Penablanca Cagayan, the Callao Caves hid a most unexpected wonder. We walked through this grand cave entrance expecting total darkness ,but instead found a quaint little chapel inside completely bathed by natural light. The multi-chambered caverns have natural overhead crevices that allowed the brightness of day into its dark recesses. Our cameras are going to be useful after all. At the end of the visit, some of us sat down to say a prayer of thanks. There wasn't enough time to explore all the chambers, so I surmised they also prayed that fate bring them back one day. Enjoy. My God. This is just too good. What a beautiful place. What a fabulous picture. I wish that they had just left the place as it was without trying to impose a "foreign" place of worship. That would truly have honored the cave. CORRECTION: The light is not coming from a "natural" crevice in the ceiling. Early in the 70's or late 60's they dynamited the tops of the caverns to let light in. There were originally more than 12 chambers in the caves but they also dynamited and blocked the chambers after the 7th or 8th (forgot) for safety. Originally the cavewalls were beautifully white.. but with early on no one really preserved that look. Constant cigarette smoking, torch smoke, candle smoke, etc. stained the colors of the cave. I grew up in the province and remembered the caves as it was originally - w/o the chapel, the walls all whitish, and several chambers. SOmething else to witness - At night outside, when the bats come out at sundown - they cover the sky like a small cloud. this is so spectacular! i never seen a place of worship like this. Wonderful place of worship. It only proves that worshiping God is not only in the 4 walls of a Church, but as each body of the Church come together, no matter where, in a cave, that Church comes to life. Blessing and glory, wisdom and thanksgiving,honour and power and might be to our God, forever. Amen. I'm always afraid of caves, I guess I've been into one only, but this one is so awesome. I guess these caves were formed sometime 30 to 70 millions years ago. It is a place were our ancestors lived and perhaps worship their perceived God. The place contains secrets of who we are.